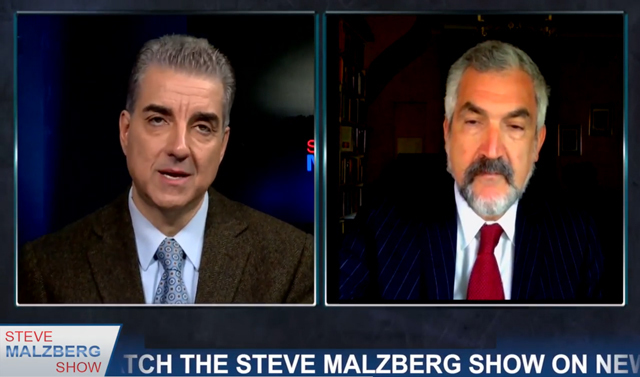 On February 7 Middle East Forum President Daniel Pipes appeared on the Steve Malzberg Show on Newsmax TV to discuss President Donald Trump's January 27 executive order (subsequently blocked by a federal judge in Seattle ) prohibiting passport-holders from seven majority Muslim countries from entering the United States. The approach is a good one. I very much endorse the idea that we have to protect ourselves and not allow in people who would wish us ill or would do us harm. But the specifics of the January 27 executive order were terrible. It was poorly thought out. You can't do that. You have to work with the departments involved and the legal specialists and the like. So I hope the administration will learn a lesson from this and not just blurt out a policy, as it did in this case. So what we've seen is a great fumble. "We can protect ourselves through what [Trump] calls extreme vetting ... it's not going to be easy, but it can be done." The biggest problem with it from my point of view is that it focuses on nationalities. There are a lot of Syrian and Iranians who are friends of ours, who want to sustain the kind of values we have. There are a lot of Canadians and Britons who are enemies of ours. You can't do it by nationality. You have to do it by individuals. The extreme vetting that Mr. Trump has spoken of means looking at individuals – and that's what he had in fact advocated last summer. Fortunately this is but a temporary ban, and I hope it will lead to something far more sophisticated. I think we can protect ourselves through what he calls extreme vetting, which I would say is a matter of both intense research and extensive interviewing, so we get to know who's coming into the country. It's expensive, it's time-consuming, it requires real expertise – it's not going to be easy, but it can be done. And I very much hope we will start the process of doing that.